As Indians, we have all heard about the coveted US Green Card. But what is it actually? What rights does it bestow the holder? And why is it so coveted by millions (if not billions) of people every year? You might not be aware that Green Card is an official nickname to the document called the " Lawful Permanent Resident Card" or Form I-551. 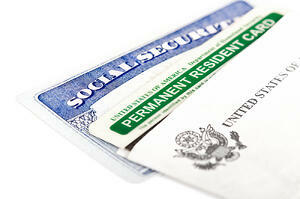 A Green Card holder is known as legal permanent resident. It is a card that enables a non-US citizen to obtain permanent residence in the United States. It is the identification document that is proof of the holder's ability to work and live in the country. The ones who have ever dreamt of moving to the USA know that there is no way around the Green Card if you wish to live in the country legally. You get to live in the only true superpower on earth and enjoy the high standards of living. The freedom to live and work anywhere in the US without restrictions unlike international workers on work visas such as H-1B. On an H-1B visa mobility and freedom are limited with little scope of climbing the ladders of development. As a Green Card holder, you can sponsor your wife, unmarried children and parents as well as siblings to live permanently in the US. You are eligible to get US citizenship after completion of a 5-year term as a permanent resident of the US. While work visas are temporary in nature, a Green Card ensures unlimited validity with a mere formality of renewal after every 10 years. Unlike work visa holders who are not entitled to Medicare facilities, a Green Card holder enjoys Medicare after 5 years of living in the US. Green Card holders enjoy quality education at lowered tuition fee as compared to international students. The tuition costs go down by as much as 80 percent. It is easier to apply for federal student loans for a Green Card holder. You do not need to go through the cumbersome process of applying for a US study visa. The advantage of being able to work both on as well as off-campus without restrictions while studying. From the tech giants at Silicon Valley to the laid-back beaches of Florida, you can work anywhere, for anyone as per your convenience. Business is booming in the US and its a great time to start new businesses as well. Obtaining certain licenses for business and trade is quicker and easier for a Green Card holder. A hassle-free working environment is guaranteed for Green Card holders as they are not subjected to certain strict working conditions in place for non-Americans. How to obtain a US Green Card? Through Green Card Lottery, also known as the Diversity Visa Program. This process enables around 50,000 applicants to be eligible for a Green Card. In order to qualify to enter the lottery under this program, applicants must be born in an eligible country. Unfortunately, India is not an eligible country under the program. 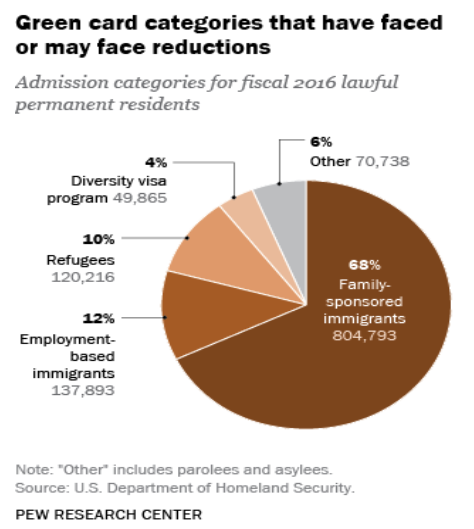 Family/Spouse sponsored Green Cards are the most issued green cards out of all categories. This ensures that families stay together when one member emigrates to the US. By being a refugee or asylum seeker. Immigrants who entered the United States as a refugee or asylee can apply for a Green Card one year after entering the country. This also applies to immediate family members of asylees. Through employment/investment, also known as employment based criteria. This is the most popular way to obtain a Green Card after the family/spouse program and is the focus of many well educated and affluent prospective immigrants. It is a broad category that includes not just an employee or the employer but also investor immigrants, special workers or people with extraordinary abilities in their respective fields. Since applying for most U.S. work visas is a very complex and time-consuming process, the best and most reliable of these options is the one that includes applying for an EB-5 visa. An EB-5 visa, also known as the EB-5 Immigrant Investor Program, qualifies you to be a resident of the US if you make an investment of $500,000 in certain qualified US regional centers. A few basic eligibility criteria are to be met and you are en route to the US in no time. The EB-5 visa offers the quickest and the most reliable way of getting that Green Card. It is also critical to remember the difference in rights of a Green Card holder versus someone on an H-1B visa. Do you really want to be in America and have no freedom to change your job, have work restrictions imposed on your spouse, and pay extra tuition fees for your children?